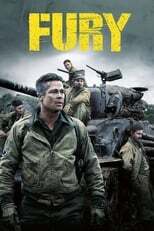 The movie rolls along a tank and its crew through the grueling battlefields of second world war in the heart of Germany unveiling the hard and horrifying facade of war at almost every step and demonstrating the heart and courage of the crew as they battle with undying resistance and courage against overwhelming odds. Fury is directed by David Ayer and was released on Oct 17th, 2014. Director David Ayer's War & Drama movie Fury is produced by Huayi Brothers Media & Columbia Pictures & was released 2014-10-15.